First up a massive thankyou to everyone who came down to the first Cardiff Anarchist Bookfair on the 23rd May, we feel the whole thing was a great success, most of the workshops were busy and around 250 people came through the door, all the stalls were happy with the reaction they got. We intend to do another one next year. If anyone has any feedback, we’d love to hear your comments. What with the donations on the door and for tea, coffee and cake as well as a number of benefit gigs the bookfair ended up paying for itself which was very unexpected, we’re very grateful for all the donations! But as the machinery of Anarchism in south Wales rolls on, there’s always more things that need paying for. As such we’re having a Anarcho-solstice benefit gig on Saturday 20th June with Active Slaughter, Kilnaboy, Filthy Habits, Jesus Bruiser, Obscene in TJ’s, Newport. At only £5 entry, it’s a treat! Congratulations on Bookfair sucess but it’s not the first one in Cardiff. We did a stall at one back in 1988 or maybe 89? Cheers Jon, never heard about a bookfair in Cardiff before, we did ask around enough, do you remember where it was held? Just came across you via Welsh Blog Feed. 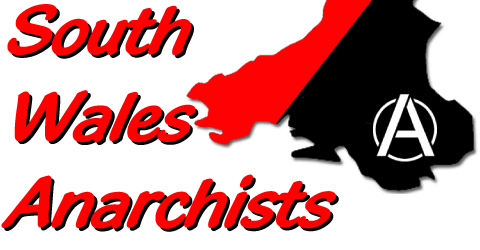 Press release: First Cardiff Anarchist Bookfair Trash the fash!